History is made at night: Pirates to the rescue? I noticed that on Galaxy FM (99.5) at the weekend they were broadcasting appeals for people to donate food, clothes and other stuff to people who lost their homes and belongings in last week's fire in Peckham. Five local 'pirate' radio stations (or as they prefer to call themselves, community radio stations) jointly broadcast the appeal. They invited people to drop off donations at Uppercuts Barber Shop on Nunhead Green, Maestro Records in Rye Lane and the Real McCoy clothing shop in Brixton - evidently many responded. This was part of an impressive display of community mutual aid which saw local people, and indeed council workers volunteering their time, coming together to respond to the fire. The local press have picked up on the story this week. 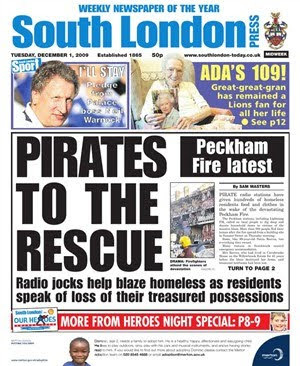 The South London Press had the headline 'pirates to the rescue', while the Southwark News has the full story, in terms of actually giving credit to the stations involved - Lightning, Galaxy, Vibes, Genesis and Ontop FM. Anyway makes a change from they usual Ofcom-led nonsense media tales of criminal radio operators disrupting the airwaves. I fully appreciate an outlet is needed for community radio stations, but wish these could be broadcast on frequencies that don't disrupt the reception of other radio stations - particularly Radio 2 in my case - but maybe it's a fruitless argument and I should get DAB.